When planning began for Voyager 2's 1989 encounter with Neptune, the planet had two known moons - Triton and little Nereid, a small, distant moon that, like Triton, is likely captured. The flyby didn't go well for little Nereid. First, it takes nearly 360 days to orbit Neptune - almost a year! - and was not in a convenient place for Voyager to meet it (unless Neptune itself and Triton were sacrificed). Second, it would be dethroned as Neptune's second largest moon by Proteus, a newly discovered moon that would receive much better coverage. Voyager 2 came no closer than 4.7 million kilometers from Nereid. All that could be made out is that it is a somewhat spherical (if a bit lumpy), 340-km in diameter little world with a relatively low albedo -15%. It rotates in 11 hours, as determined by light curve data, further supporting the idea that it is captured (not being tidally locked is unusual for a moon). Here are Voyager 2's two best views. 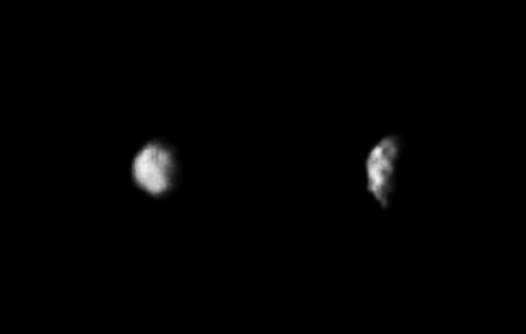 The first shows the lumpy little world in a gibbous phase as Voyager approached on August 21, 1989, and the second shows a crescent on August 24 - Nereid was "in front" of Neptune, so closest approach was earlier than the August 25 closest approach of Neptune. Yet another world cries out for exploration!